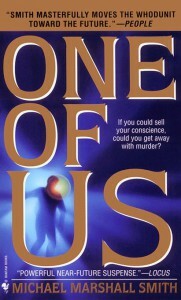 One of Us, Michael Marshall Smith, Bantam, 1999 (c1998), ISBN 978-553580693, 368pp. The spine of this book labels it as “suspense,” and it certainly does share some aspects of that genre. It is also, however, a science fiction, mystery, fantasy, speculative religious thriller. This is both the joy of the book, and its curse. The joy is simply reading it for the excitement of not knowing what Smith is going to throw at you next. The curse is wanting it to coalesce into something besides the ephemeral pleasure of a roller coaster ride, and being disappointed when the coaster car simply comes gliding back into the station. Hap Thompson is a petty con man who has fallen into the less-than-savory business of being a dream-washer and memory-holder. This would have likely been fine, except for his character flaw of being able to turn down wads of cash hovered virtually in front of him. He agrees to do a side memory job for a client so as to see all of the cash rather than just the skimmed bit given to him by his employer, REMtemps, and instead finds himself holding onto the memory of the murder, and if he doesn’t get rid of it soon, LAPD will be on him. It doesn’t matter that he didn’t commit the murder–just having the memory is enough to set him up for life. Michael Marshall Smith hovers between writing like Raymond Chandler and William Gibson, and the result isn’t as unpleasant as that match might seem (in fact, I’ve long thought Gibson’s style of cyberpunk fit the early noir of Chandler, and only needed the psychological edge of James M. Cain to really perfect it). The book breaks down towards the end, however, when Smith starts trying to channel either Benny Hinn or Joseph Campbell. This is similar to the macguffin in Neal Stephenson’s work, where he actually tries to make sense of all the fun and all it sounds like is pseudo-scientific claptrap. 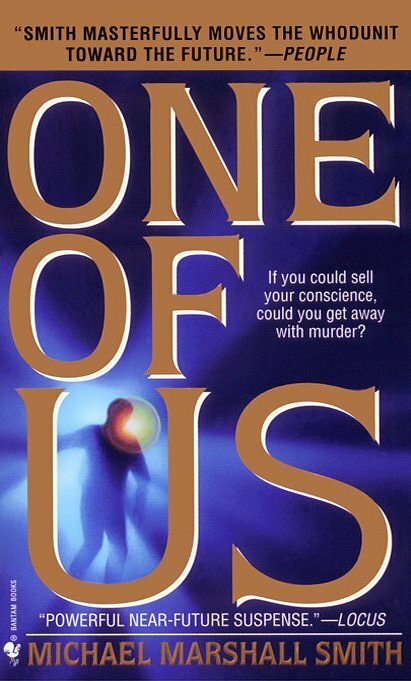 Smith’s an interesting enough writer to watch, however, and there are a number of science fiction/mystery novels that don’t even come close to being as engrossing as One of Us. You could do much worse for pleasure reading, and there’s not much better being published today.